Skinless chicken breasts are a traditional backbone of healthy weight-loss plans. Because chicken has no carbs and just 5 g of fat per 3- to 4-oz. 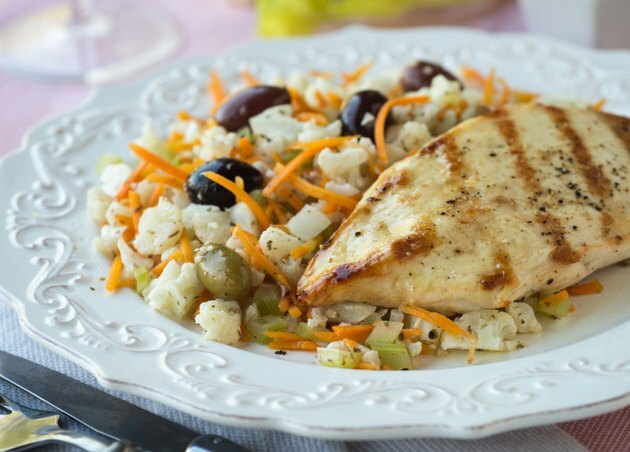 serving, many dieters rely primarily on chicken for their protein needs. Whether you prefer the breast or a skinless thigh or leg -- which are similar in low-fat content -- chicken is an excellent source of lean protein and has essential nutrients, including iron and zinc. A skinless breast or thigh can become as diet-busting as a Big Mac if you suffocate it in gobs of butter or a heavy coat of breading. Go easy on the fat -- mist, don't soak, the meat -- and baste poultry with your favorite herbs mixed into low-sugar fruit juice, wine or vinegar tempered with a bit of sugar-free sweetener. Similarly, low-fat plain yogurt with tarragon and mustard stirred in is an excellent substitute for high-calorie mayonnaise in chicken salads. Broiling, baking, grilling and poaching are ideal ways to cook chicken when you're trying to lose weight, but keeping the meat moist can be a challenge. To keep the chicken juicy, marinate it in low-fat buttermilk spiked with garlic, paprika and poultry seasoning overnight or at least a few hours before cooking. Marinades containing acids, such as citrus juice and vinegar, break down the fibers in chicken, resulting in optimum juiciness. Line a baking pan with parchment paper or bake the chicken in parchment or aluminum foil packets to wind up with a moist bird. Become a food-label sleuth to sniff out high-sugar and high-fat sauces that could sabotage your weight-loss efforts. Watch for hidden sugars, high-fructose corn syrups and other sweeteners in barbecue sauces. Many commercial marinades and prepared sauces can turn your healthy chicken breast into something resembling dessert. Lean and luscious ways to dress your chicken include fruit salsas, sauces made with pureed fruits and vegetables enlivened with herbs, or make a creamy sauce with canned evaporated skim milk and low-fat shredded cheese. Misjudging portion sizes can derail a diet. A 3- to 4-oz. serving of chicken is roughly the size of a deck of cards or an adult's palm -- that's the palm only, not the fingers. This translates to a single skinless chicken breast or thigh or two skinless legs. Portion sizes in restaurants are out of control, and even so-called healthy options can reasonably feed two adults. When you're eating out, request a to-go container when you order your meal. After being served, box up half the food right away so you won't be tempted to clean your plate.